The Best Canadian Lifestyle Bloggers from thousands of Lifestyle Bloggers in our index using search and social metrics. Data will be refreshed once a week. Canadian Lifestyle newsletter is a comprehensive summary of the day's most important blog posts and news articles from the best Canadian Lifestyle websites on the web, and delivered to your email inbox each morning. To subscribe, simply provide us with your email address. Vancouver, BC About Blog For more than 40 years Alive Magazine has brought readers tips, articles and recipes to improve your health and wellness. Facebook fans 22,423. Twitter followers 14,232. London, Ontario About Blog A Canadian fashion, beauty and lifestyle blog that focus on personal style, beauty, home décor and so much more! Facebook fans 3,800. Twitter followers 10,022. Toronto About Blog Casie Stewart is an award-winning lifestyle blogger and expert in social & digital media. And have been documenting about her life and adventures on the internet since 2005. Facebook fans 2,392. Twitter followers 24,010. Ottawa, Canada About Blog The Best Of This Life was started by Emily Smith, in 2011. She covers a wide range of lifestyle topics such as recipes, fashion, home decor, family, motherhood, and local events. As a devoted wife and mother of two, Emily is committed to using the highest quality brands, products, and methods in her everyday life, and she carries this integrity into her writing. Facebook fans 8,172. Twitter followers 9,533. Vancouver, Canada About Blog My name’s Alexandra Grant and I’m the creator and editor of To Vogue or Bust, my digital playground for sharing everything that inspires, moves and excites me! To Vogue or Bust is a space intended to give the modern millennial woman the roadmap to achieving a life that’s as stylish as it is adventurous, empowered and fulfilled. Facebook fans 4,147. Twitter followers 6,902. Toronto,Canada About Blog The Official Lifestyle Blog Of Media Personality Nneka Elliott. You’ll get some fashion, lots of Caribbean culture, adventures in fitness and a whole lotta tv/media talk. Facebook fans 3,648. Twitter followers 9,241. Edmonton, AB About Blog Canadian fashion blogger, Hannah Kaup, shares the best and most innovative products in: women's, men's and children's fashion; beauty; lifestyle; food, and technology. Facebook fans 1,200. Twitter followers 1,407. Facebook fans 6,599. Twitter followers 7,896. Winnipeg, Manitoba About Blog A Canadian style blog with inspiration for living a confident and stylish life. Fashion, beauty and decor tips from Winnipeg blogger Jennifer Ashley. Facebook fans 1,848. Twitter followers 3,745. Toronto, ON, Canada About Blog The Cardinal Press is a lifestyle blog about finding everyday creativity through beauty, literature, fashion, travel, and art. Facebook fans n/a. Twitter followers 2,136. Calgary, Alberta About Blog Hey! I'm Justine Celina Maguire; a creativepreneur, blogger and free spirit who's passionate about creating in every area of my life and sharing it. Facebook fans 452. Twitter followers 606.
toronto About Blog I’m Jessica, the writer behind Diary of a Toronto Girl. Here you’ll find everything from outfit inspiration to travel guides to Instagram tips. Facebook fans 895. Twitter followers 1,623. Toronto, ON About Blog I hope you find many inspirations and ideas to elevate your daily life! authored by DIY & Lifestyle Blogger Natalie. Facebook fans 2,154. Twitter followers 2,319. Halifax, Nova Scotia About Blog I'm a lifestyle and travel blogger, femme lesbian, and adventure seeker who calls Halifax, Nova Scotia home. Providing information and inspiration to travel lovers and positive thinkers. Facebook fans n/a. Twitter followers 400. Canada About Blog My goal and motivation with this blog are to help people live a balanced life in the 21st century. I believe that Faith, Family, Finance and Food are the columns of a balanced life. St. John's, NL About Blog Blogging has quickly become a passion. I have spent hours behind the keys. While launching my blog and educating myself about all the technical jargon, I discovered my love for the design aspect of blogging. By that I mean designing the brand of my business. Creating all the fun blog graphics, business logo and Pinterest pins has quickly become a fast side hustle idea! So much so that I have decided to start a blog branding business. Facebook fans 74. Twitter followers 392. Durham About Blog My name is Jennifer. Spiced Beauty is my Spiced Life: Beauty, fashion & Lifestyle Blog. Facebook fans 1,339. Twitter followers 4,521. Vancouver, BC About Blog Treasures & Travels is a lifestyle blog by Tegan & Lindsay, two sisters from Vancouver, BC. With a love for all things creative they daily share their favourite recipes, diy projects, outfits, favourite brands, beauty tricks, hair tutorials, and more! Facebook fans 5,197. Twitter followers 2,050. About Blog Welcome to MakyChurchill’s blog, a Lifestyle/ Fashion blog and we bring to you topics on family, relationship, pregnancy and childbirth, parenting, health, fashion, blogging and general knowledge topics. Facebook fans 9,111. Twitter followers 2,411. Windsor, Ontario About Blog My name is Amanda and I live in Windsor, Ontario. I work in advertising but I’ve always been inspired by fashion, home decor and shopping for a steal. Rose City Style Guide is a space to share and chat about things that inspire me on the daily. Facebook fans 1,208. Twitter followers 462. About Blog Downtown Money is a millennial online magazine aimed at helping our generation move forward. Downtown Money is a Toronto run E-magazine showing the most popular handpicked and curated content for the hardworking millennial. Our readers love Downtown Money because it gets them updated on the world of money and business in a short and sweet way. Facebook fans 5,909. Twitter followers n/a. Okanagan Valley, Canada About Blog My name is Mary Jane, and I write Home for the Harvest. I have lots of help around the garden from my husband, who also takes many of the photos on this site. Also helping me along the way are my wonderful friends, mentors, and teachers. This website serves to share about living a healthier life through organic gardening, choosing clean plant-based products, making nourishing food, and connecting with nature on a daily basis. Facebook fans 831. Twitter followers 3,553. Toronto About Blog Christian Confidential - Is a carefully curated lifestyle blog tailored to fashion, fitness, travel & pop culture. From street style fashion to work out tips, travel recommendations and more. Facebook fans 804. Twitter followers 1,397. About Blog Ma Belle Vie is a relaunched blog started in 2015 by Janella a Canadian Mother of 3 and wife. The blogs name Ma Belle Vie means my beautiful life and the Blog is all about the beauty of life through Food, Recipes, DIY, Beauty, Fashion and Life itself. Saskatchewan, Canada About Blog Journey Through Life Documented. My name is Rowena, a wife, and mom to a 5-year-old little boy living in the Prairie part of Canada. If I don't cook and make crafts, I usually hang out by my computer creating content and managing my online store. And, I love graphic designing. About Blog The reality of living with mental illness. You will find snippets of stories on this blog site. Some will make you happy and some will likely anger you as to the treatment I have received. It's an emotional rollercoaster. But a story nonetheless that will hopefully help someone else on the road to recovery. Canada About Blog Follow me as I become a mom to two littles. Finding time to share advice on fashion, cooking, crafts and a healthy lifestyle as I go. Facebook fans 1,662. Twitter followers 839. Ottawa About Blog A Canadian based Lifestyle Blog Originating in Ottawa by Erin Elizabeth. Fashion, Beauty, Lifestyle, Wellness and Career. Facebook fans 307. Twitter followers 762. Toronto About Blog I’m Victoria, I created A Side Of Vogue to be a place that inspires you to continue to live your life, but to live it with style. Facebook fans 462. Twitter followers 2,480. Toronto, Canada About Blog My goal is to inspire others to be creative with how they get dressed each day. I believe that stylish outfits are within reach for anyone and that you don’t have to spend a lot to look great each day! After all, I’m your average girl, with an average budget, and an average body. Facebook fans 426. Twitter followers 2,112. Montreal, Quebec About Blog Montreal Maven is a blog I created to share my love for my city (Montreal…duh! ), food, culture, travel, health, fashion, and anything else I feel like writing about. Facebook fans 455. Twitter followers 204. Toronto, Ontario About Blog Hi I'm Annika, a proud Mother and Fashion Enthusiast with a huge zest for life and all things beautiful. My mission with The Stylish Reid is to create an interactive online community and resource hub that inspires and encourages people worldwide to live life and embrace their curve. Facebook fans 3,966. Twitter followers 146. About - Certified Holistic Nutritional Consultant™ and Registered Social Worker. I work with people to heal their relationship with food for sustainable health. Letting go of the emotional weight, so that we can find the right balance for you! About - JustineCelina.com is a Canadian lifestyle blog with a creative eye for beauty, fashion, food, travel, music, design and DIY based in Calgary, Alberta. About - Life, Set Sail is written by me, Brittany Savage, and based in Calgary, Alberta. I like to make things beautiful. I think that beauty is something that can be found both on location as well as in the perfect taco (and I do love tacos). About - See what life in Calgary is really like through our blogs on Calgary & best patios and markets to real life advice from Calgarians. About - DOTE MAGAZINE is a Calgary based lifestyle magazine. About - My name is Linda Hoang and I am an Edmonton-based blogger who writes about food, lifestyle/events, travel, pets and my community. About - Dutchie Love is an Edmonton-based lifestyle blog written by Nicole Winski that focuses on everyday life, travel, style, interior design and recipes. About - Kristinalynne.ca is a design and lifestyle blog that centres on creating a lifestyle inspired by beautiful interior design combined with being a new mother. Much of the blog focuses on incredible before & after transformations as Kristina and her husband, Ryan, buy, renovate and sell homes in Edmonton, AB. About - Avenue is a monthly lifestyle magazine featuring Edmonton Alberta's best in food, fashion, real estate, shopping, homes and design, the outdoors, arts and culture as well as issues the city currently faces. About - Lethbridge living magazine is a bi-monthly publication featuring articles that focus on the people and diversity of cultures in Lethbridge and Southern Alberta. About - Cristal King Photography: Medicine Hat Wedding and Lifestyle Photographer Blog - Check out some of my past photo shoots. About - The snow is starting to melt, and the air is feeling a little more fresh! Say hello to spring with so many activities and events to get up to in and around Red Deer in the month of April. Experience Spring Spring in Red Deer is something to experience and some of the city’s finest culture institutions have put together. About - Big changes are happening for Hygge Spirit Photography! We have officially outgrown the home studio space and are moving into a new photography studio downtown Red Deer! This move is all about you guys! I am so happy to be able to provide you with more convenient location, professional atmosphere and not to mention. About - Lifestyle and natural light photography for Spruce Grove, Stony Plain, St. Albert and Edmonton. About - A 40-something sweet and sassy, Canadian lifestyle blogger, bipolar mother, and wife that loves all things stylish. From rustic decor to comfy clothes you can live in. Life is about simplicity and finding the beauty in everything we do. About - A lifestyle & travel blog for the modern mother by Abbotsford Mom Blogger Codi Lynn. About - Welcome to Burnaby! Discover exquisite dining options, accommodations, shopping, meeting venues & more, all just 15 minutes from downtown Vancouver. About - A Vancouver Island girl with a background in travel and photography, currently living in Campbell River and photographing weddings and families all over the west coast. About - Lifestyle Blog featuring home decor, DIY and Mamahood. About - A lifestyle blog based in Victoria, BC featuring DIYs, recipes, local businesses, insights and adventures. About - Vancouver is a beautiful city located near the Pacific Ocean. Our lifestyle blog covers everything about the city as well as other cities such as Coquitlam, Surrey & Penticton. About - CeeCee is a writer, mother, wife, self-acclaimed shopaholic and style expert. With her passion to inspire others to find their own personal style, she’s always on the search for fabulous deals. About - Boomer Jerritt; primarily a lifestyle and recreation photographer, his editorial imagery can be seen in various tourism initiatives throughout BC. About - Ideally Speaking is a Canadian lifestyle blog about the romance & adventure of everyday life, as well as creativity, exploration, & being a girl who travels. About - Dawson Creek and Northern BC Photographer specializing in Lifestyle, Family, Maternity and Newborn photography. Capturing life's unforgettable moments for you. About - Alicia Fashionista is a place for the everywoman who loves to travel, sees beauty in the ordinary, and believes that confidence is the best accessory. About - Ava to Zoe is a Vancouver Based Lifestyle Blog that is play on Janette's two young daughters’ names. Ava To Zoe is a safe place to fall & know you're not alone! You can expect fun recipes, honest & real reviews, travel and everything in between! About - Treasures & Travels is a Vancouver based lifestyle blog run by two sisters, Tegan & Lindsay. We blog about all the things we love from recipes to DIY's, beauty and travel. About - A Piece of Elise is a creative outlet in which I channel all my fashion obsessed energy into something productive. Here you find all the things that inspire me in hopes that they inspire you too. About - YAM is Victoria's Home & Lifestyle magazine :: You and Me, Living Smart. About - A Canadian style blog with inspiration for living a confident and stylish life. Fashion, beauty and decor tips from Winnipeg blogger Jennifer Ashley. About - A Winnipeg- and Paris-based fashion blog. Style, travel and beauty inspirations from Canadian writer Cee Fardoe. About - A Canadian style blog that highlights my love for mixing high and low fashion. About - Only in The Peg is the official blog for Tourism Winnipeg, profiling everything to see and do in our city. We provide a fresh and fun look at Winnipeg’s attractions and events. About - The New Mrs. Hamilton is a fashion and lifestyle blog written by me – Brooke Hamilton. This blog was created in 2013 as a place to showcase my creativity, inspirations and document my life as a newlywed. About - Look Local is a lifestyle magazine celebrating the Oakville and Burlington communities. Featuring local food, community, events, home, garden and more! About - Here in the Burlington Ontario area we have such a wonderful sense of community. I wanted a place that best reflects the people, the places and the lifestyle that we call home. About - A Wedding & Lifestyle Photography Blog by Burlington Photographer Maggie D.
About - Ashley Renée Faye as your photographer for your wedding, newborn or family portrait session! Located in Guelph, Ontario but will travel all around the tri-city and GTA! About - Nicole Rae is a caffeinated daydreamer that loves to write about the latest beauty, fashion, and lifestyle topics. About - A daydreamer, a foodie, a thrill-seeker, an explorer - Rosalyn Gambhir is the woman behind the lifestyle blog The Staycationer. Whether its exploring the local food scene with her foodie partner-in-crime or taking in the view from her favourite cafe, Rosalyn is a tourist in her own city and beyond. About - Jonna Maternity, A Kingston Ontario Photographer. Oh my Blog! I am so behind in sharing gorgeous sessions..
About - Welcome to Life in London! Sharing all there is to know about Life in London, Ontario. Business, Community and Lifestyle. About - Kelly Connor is a 30-something mama to one exuberant little girl. Together Kelly and her husband are raising their daughter in an urban setting in downtown London, Ontario. About - A Canadian based Lifestyle Blog Originating in Ottawa by Erin Elizabeth. Fashion, Beauty, Lifestyle, Wellness and Career. About - Mode XLusive is your destination for smart fashion talk that offers a glimpse into the local Ottawa fashion and culture scene. About - The Best of this Life covers a range of lifestyle topics; recipes, fashion, home decor, family, motherhood, local events and more. Within each of these, our goal is the same – to bring you inspiration, to connect with you, to ignite a spark of creativity in your own life. About - Award-winning Ottawa blog of Danielle Donders: mom to 3 young boys, photographer, writer, and professional dilettante. Based in Manotick, Canada. About - Sudbury Living magazine is the premier lifestyle magazine in Sudbury, Ontario. All of the content is local and features articles on home décor, health and wellness, arts and culture, fashion, food, travel and much more! About - Diary of a Toronto Girl is mainly about lifestyle, I occasionally write about my other loves: fashion, beauty, social media, travel, and food! About - I’m A Little started as a personal passion project + creative outlet but it’s grown in to a space to inspire your senses. From fashion to food, beauty + design, this is my little place to showcase all of the things that are infinitely me. About - Hi, I'm Jackie! I'm a Toronto based fashion, beauty and lifestyle blogger. My goal is to inspire other like-minded women live a more beautiful life. About - Grace Yeung is a Toronto based blogger and photographer. Grace started her blog as a creative space to share all the things she is passionate about – food, travel and lifestyle. She hopes to share her experiences through her photos and stories content. About - Montreal Maven is a blog I created to share my love for my city (Montreal…duh! ), food, culture, travel, health, fashion, and anything else I feel like writing about. About - A Montreal-Based Lifestyle Blog. Welcome to With All My Affection! I created this blog to share my love for food, fashion, beauty and travel to hopefully inspire you to try new things and to live your life to the fullest. About - Showcasing my affordable style, delicious eats across the globe, plus my favourite beauty finds. About - Welcome to our blog, theselostsouls! Here you'll find our blog posts where we explore Montreal, fashion trends, Montreal eats and more!. About - Miss Vay is a collaborative blog based in Quebec City that focuses on beauty, but is also interested in fashion, lifestyle, restaurants and outings. About - This blog is for any fashionista who wants to be inspired by everyday outfits, for the foodie who is looking for the best places to eat and for the traveler who wants to discover the hidden corners around the world. But above all, The 26th look reflects the passions and personal inspirations of its creator. About - An ultra-feminine blog that will introduce you to the latest trends in beauty, fashion, lifestyle, event planning in Quebec City and more! About - Montreal's cultural blog that feeds your fashion, art and food cravings!. About - You’ll find fashion, health & fitness, reviews, adventure and general life topics. About - Raw Fashion is a Canadian based lifestyle blog originating from Saskatoon, SK. My name is Tiara Jackle and I started this blog in September 2013 with the desire to share my unique fashion tastes, sustainable-living tips, honest reviews on products, fun DIY projects, personal health knowledge and recipes. About - I'm Megan and welcome to These Things I Love - my corner of the internet where I share my passions for cooking, healthy living, raising a family and other things I love. 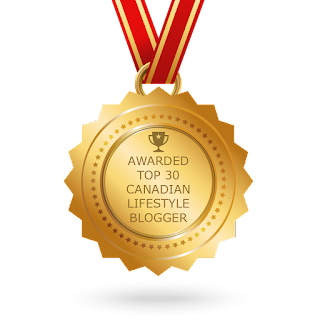 CONGRATULATIONS to every blogger that has made this Top Canadian Lifestyle Bloggers list! This is the most comprehensive list of best Canadian Lifestyle Bloggers on the internet and I’m honoured to have you as part of this! I personally give you a high-five and want to thank you for your contribution to this world.